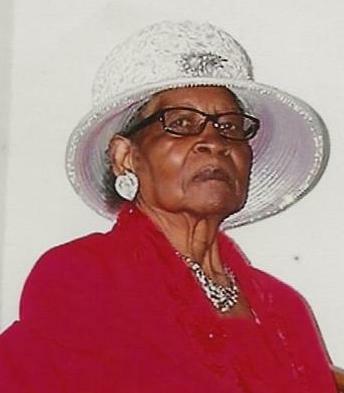 Obituary for Viola (Bivens) Ward | Dixon Funeral Home, Inc.
Funeral services for Viola Bivens Ward, 98, of Cedar Lake will be Saturday, March 23, 2019 at 11:00 a.m. at Greater Mount Zion Church in Brazoria with Elder Roland K. Hendricks officiating. Burial will be follow at St. Paul Cemetery in Brazoria, TX. She passed away on Sunday, March 17, 2019 in Lake Jackson, TX. She enjoyed cooking, fishing, singing, visiting the nursing home, carrying cakes to the elderly, spending time with her family and always lending a helping hand to others. While attending Jerusalem Baptist Church, she served as Past Mission President and was a member of the choir. Her motto was “I’m hopping but I ain’t stopping.” She was a faithful member of Greater Mount Zion Church and strong Christian woman who loved the Lord with all her heart. She was preceded in death by parents, Sam and Louise Austin Bivens; husband, Hammie Ward, Sr.; sons, Bobby Joe Ward, Robert Earl Ward, Lawrence Ray Ward, Chris Ward; brother, Randolph Wells. She is survived by her daughters, Verna Bishop, Houston, TX, Louis Hutton, Arlington, TX, Lorene Mitchell (Lenzy), Lake Jackson, Rosa Lee Easter, Richmond, TX, Martha Bell (Otis), Fresno, TX, Brenda Ward, Houston, TX; son, Hammie Ward (special friend Greenevelyn Hawkins), Houston, TX; brother-in-law, Dave Ward, Cedar Lane; good friends, Costella Bonner, Deacon Thomas Hendricks and Sister Sadie Hendricks and a host of grandchildren, great grandchildren, great great grandchildren, nieces, nephews, other relatives and friends. Active pallbearers will be Frank Petteway, Jr., Alphonzo Ward, Paul Ward, Jason Ward, Michael Bishop and Lenzy Mitchell. Visitation will be Friday, March 22, 2019 from 4:00 p.m. to 7:00 p.m. at Dixon Funeral Home in Angleton.